I've added embellishments from Flight of Fancy Butique on my very plain crazy quilt I made ten years ago when I was a beginner. I didn't know anything about crazy quilting then; what kind of fabrics to use, how to piece them, how to do seam stitches. I had to learn everthing by myself. I bought a fabric set for crazy quilting named "Very Victorian" (isn't it nice naming?) of some Ebay shop and tried to piece them and did seam stitched with my best efforts. But it's too simple and plain and seems more embelishments required for present point of view after ten years. Isn't it better now? Here are #5 and #6 blocks finished of Gipsy Garden Collection. Three other blocks are left to be worked. When I heard about "Red Hat Society" and read Jenny Joseph's "Warning" a few years ago, I was so impressed I bought this pin by auction. Though I hadn't remembered it since then, I happened to find it and decided to use. Here's a small pouch I've made. The print is of Gerda Wegener, a Danish woman artist in Art Decor period. You might remember this small cqed block. I've also used an old earring from my drawer. 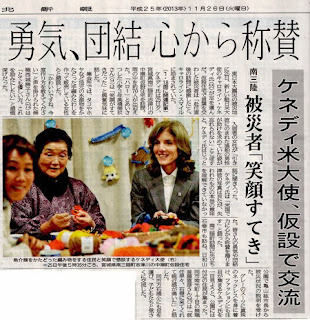 I would like to tell you, all my US friends, how much we Japanese people are welcoming our new US Ambassador. You must know she is Ms Caroline Kennedy. On November 19, she travelled by horsedrawn carriage into the Imperial Palace to present her credentials to Emperor Akihito. After a week, she visited to Sendai in Miyagi and other places to meet people affected by disasters of two years ago. What a big encouragement for us!! It's fifty years ago when her father, President Kennedy was assassinated. I was a junior high school student then. I remember how we were shocked with the sad news. I've never thought that little girl would come to Japan to work for our two countries' friendship! There's always a future hope. Here are CQJP blocks I finished recently. My theme is Japanese colour this year and the blocks are only seamstitched. But from the beginning I was planning each block would be combined with Yumeji Takehisa's illustration to make a fabric book. He was a very popular artist from the early 19c's in Japan. I looked for some suitable cards from my postcards colletion of his work for my blocks today. Don't you think this card is perfect for the above block? This is another example. A set of January block. When I started my college life in Tokyo, my room was very close to the Zoushigaya Cemetery, where lots of famous artists and writers were rested. I liked to wander around there to meet them oftenly and Yumeji was one of them. His grave was very small and pretty, I felt. Here's Annet's block of Round Robin in Fibre Fever Group before my work. Her theme is Dutch colour. Now her block is ready to be sent back home. This is another pretty thing in Dutch colour. I added cotton lace and pins on Wilma's pin cushion. In Corolado I was very lucky to be taught by Lorraine from Canada how to make Concertina roses, though I have to confess still I am in practicing stage. A small crocheted motif dyed in light turquoise is also from Lorraine. It's a great pleasure and luckiness we could see lots of crazy quilted works by talented ladies in person. Diane M's. With this work she won a prize of "Crazy Quilts are Quilts too" Contest by Thearica B.
Lorraine's project from Judith Montano's class. Lauri's beautiful fan quilt. Her stitching is amazing! Cathy K's "I Love Paris" block. Colleen's "Moulin Rouge". Everyone must love dancer's leg from layered lace petticoats! Connie's "Victorian Ladies" wall hanging though unfinished yet. Those ladies are all from her family. Gerry H's cqed rabbit. How cute! She opened her house for this retreat, cocked and served so delicious foods for us everyday, gave us joyful games, prepared goodie bags, ......organized everything perfectly. In addition I was welcomed to stay at her beautiful house with other three ladies. Thank you very much for your hospitality for all us!!! There were too many nice things to tell and show you.